We’d like to add a small page around FGW’s interesting use of PR. Let’s take a quick look at the #greaterwest campaign, where £7.5Bn is being invested in the rail network. 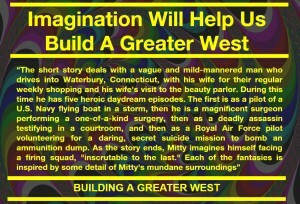 Building a Greater West! FGW logos everywhere! 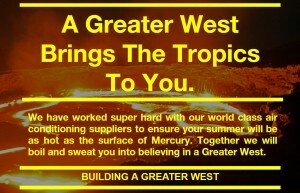 Great Greater Greatest West! Except, it’s not FGW’s money! The money they’re “investing”? That’s the same proportion of money you pay every day for a ticket! Yes indeed, a case of interesting marketing! It’s Network Rail’s money! That you, and I, as passengers, and taxpayers are paying! Take a quick look, and see if you can spot who’s bringing in the investment. No cheating by looking at the small print! The very small print! However, if FGW would like to take credit for #GreaterWest, we’re more than happy to help! 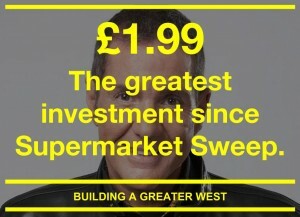 Amuses me that the FGW ads deliberately make it sound like they are investing money. Till you read the small print. It's all Network Rail. RT @FGW The greatest investment since Brunel. 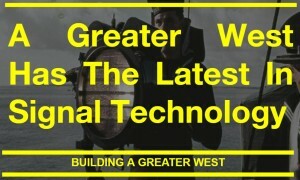 Together with Network Rail we're building a #GreaterWest -> How much is FGW contributing? @FGW why are you proud of building a better west, when it's network rail that are investing and building, badly phrased, misleading. 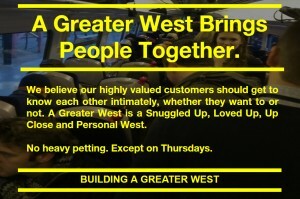 Can so many customers have mis-read the #GreaterWest publicity? New Year, higher price, bigger profit – same abysmal service! @FGW "I'm a great westerner." 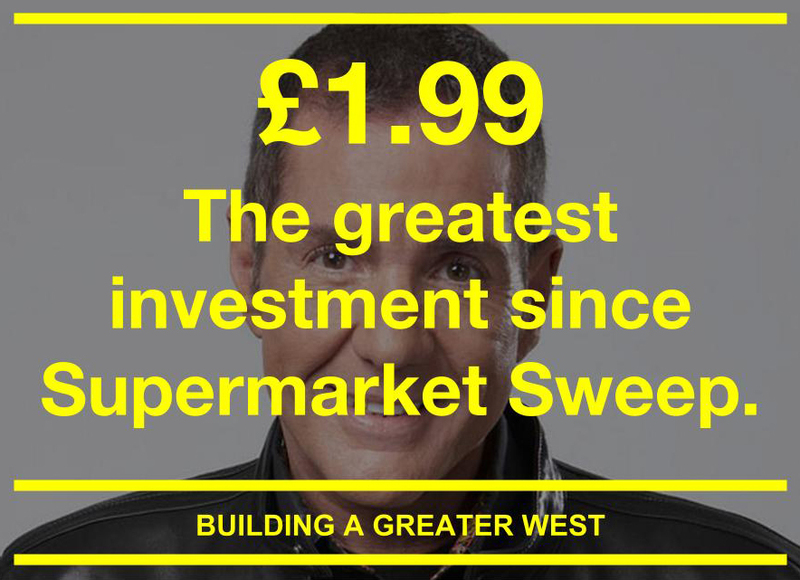 #imagreatwestener. That's why I never get anywhere on time and throw my money at horrific @fgw train services. @mat_gan @FGW It's not their money though – they're just trying to take credit for it. Don’t be silly! Even the posters with few words and no Network Rail logo make it very clear! Don’t they? @FGW "Fare and tax payers in conjunction with Network Rail are improving infrastructure for incumbent Train Operating company…"
@SparkyInTheUK @dunktankdave @CommutingRants @FGW @PrivateEyeNews @fgwkmc it just needs john terry to show up and take credit too. It seems everyone has mis-read the publicity! @SparkyInTheUK @fgwkmc @CommutingRants LOL, so @FGW happy 2 blame @NetworkRail but also want the credit for their investment too! Nice. Even Private Eye, with its studious editor and sub-editor mis-read the #GreaterWest publicity! Reading @FGW poster about building a greater west. Listening to the announcement of yet another broken down train. @FGW No.48p per £ is what you would pay them *anyway*. Your posters suggest YOU are paying for £7.5b upgrade.So what exactly are you paying? Let’s see what #GreaterWest will bring! @FGW that's not building a greater west. That's reacting to demand of your long suffering pax and should have been done 5 years ago. @cheviotbeulah We are increasing peak time capacity by converting one First Class carriage into Standard on High Speed Trains. Due to FGW’s mis-prediction of number of First Class passengers several years ago, resulting in lots of empty First Class carriages because the economy collapsed! Even though that work is underway, and First Great Western recognises the overcrowding problem (despite insisting it’s not a problem), there’s no additional push to declassify First Class carriages more often until the work is finished! @cheviotbeulah We are installing free WiFi on all of our High Speed Trains. I love that FGW ran a TRIAL of wifi in 2013. Hey, maybe the data will show people PREFER being bored/unproductive while sitting in squalor? We’d have possibly worked a little harder on stopping trains from breaking down! At least passengers will be able to complain much more quickly! @cheviotbeulah We are employing more customer hosts at key stations to assist our customers with their journeys. This may be good! So more staff at Bristol, Reading, and London Paddington! @cheviotbeulah We're investing £10 million in upgrading station facilities. Our collective nose twitched at this, given that FGW actually manage so few stations! Perhaps the money will be spent on mop buckets to collect rain water from leaking roofs! @cheviotbeulah We're adding new services to Melksham, Paignton and Portishead. This is great news! Assuming the trains don’t break down, and there is sufficient room on board. @cheviotbeulah We're investing in brand new car parks including a new multi storey car park at Bristol Parkway. FGW is investing in car parks? Talk about diversifying a portfolio! Pop up restaurants and car parks! @FGW @fgwkmc it won't make a difference but thank you. I hope your boss realises spending millions on adverts instead of service is moronic. @FGW @josephcritchley The issue, you idiots, is that even one penny spent on ads is money not spent on improving your awful service! Yup… @FGW 1552 PAD:WOS #SardineExpress was appallingly squashed. Is this what being a #GreatWesterner is all about? Hi @FGW does this talk of investment and improvement from @networkrail mean we can see fare (fair) prices go down? @FGW Ad – £7.5 billion. The greatest investment since Brunel but still we have signalling problems most days. Where is all this money going? @FGW rather thn spend circa £200k for a metro wrap (which won't improve ur brand rep) wouldn't u be better off investing it in your service? 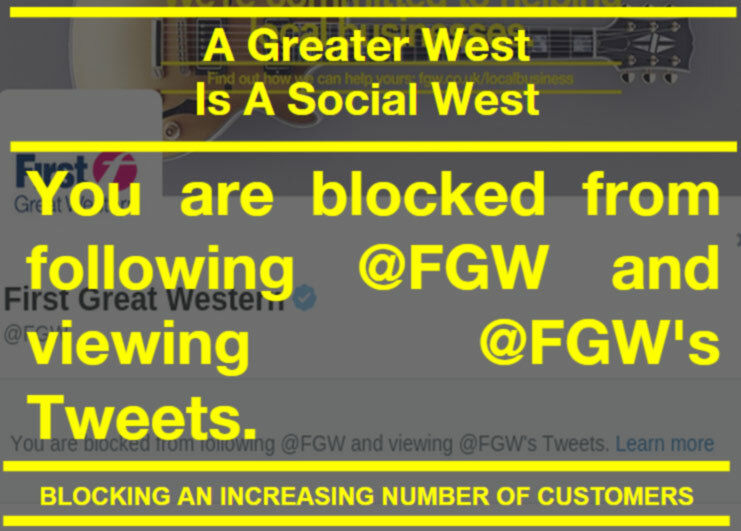 @FGW when FGW work with network rail in 'building a greater west', exactly what is FGW's contribution? Same as it ever was, a percentage of ticket sales! It’s taxpayer money! That’s marketing for you! @FGW Quite – impression is it's FGW 'Biggest Investment since Brunel' – misleading! Just look at the huge Network Rail logo! You can’t see it? Try harder! #GREATERWEST! There’s our friend, the #GreaterWest poster, lurking behind! @FGW I think it's about £7.4billion with the rest being spent on fielding questions with the reply…. "sorry that's commercially sensitive"
@fgw what %age of the £7.5bn investment 'in the west' is out if FGW pockets? None! :) Just the usual ticket payments to Network Rail! When did that ever get in the way of a good #GreaterWest campaign! 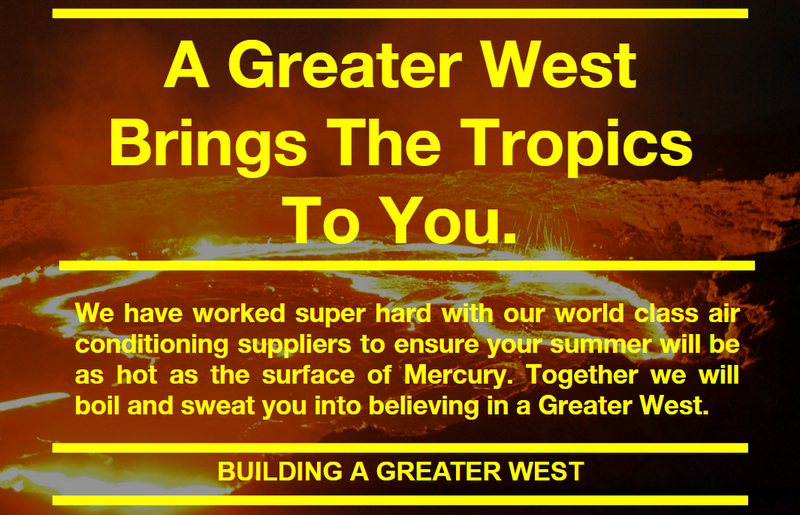 How Great is the #GreaterWest? Pretty Great! 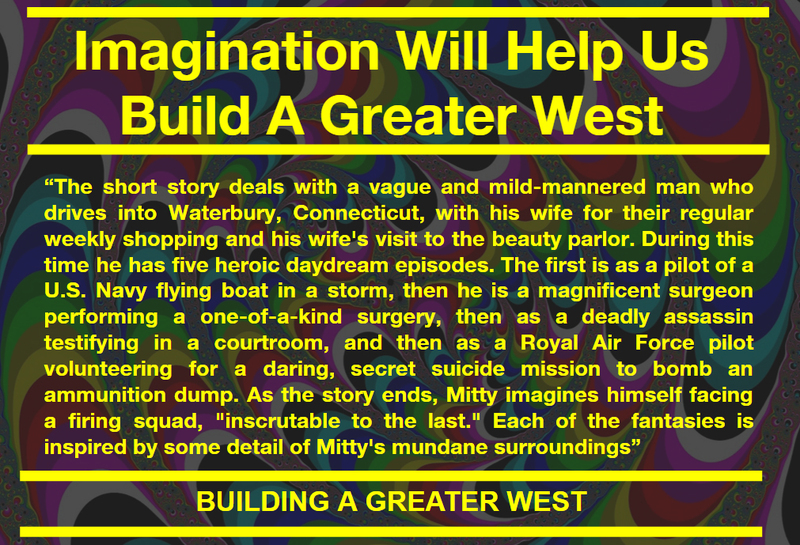 We're less #greaterwest and more #marginallylessshitthanatpresentwest but even that isn't guaranteed… Electrifying! @FGW why does First claim to be building a greater Western, when its the public tax paying for it via Network Rail? #GreaterWest train too long for platform no announcement so could not get off at Freshford LIVID! Based on this week's efforts, it's good to know we're trusting @FGW and @NetworkRail with building a "greater west". Another day, another delay. All part of a "greater west". Cheers @FGW. Cheers @NetworkRail. @FGW signal failure, train failure, rolling stock problems higher ticket prices all part of building a greater west. If this is Building A Greater West, Network Rail are probably very happy their logo has been sidelined from the First Great Western marketing! @FGW 1735 PAD-MAI is rammed, and late departing. "FGW – Building a better sauna", or is it a cattle truck? @fgw Running late again, #FGW. This will be #late number 91 this year. 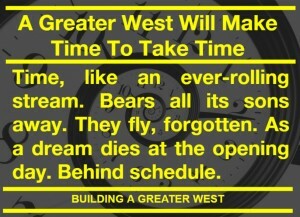 Is that #greaterwest thing just an elaborate prank? @CommutingRants @FGW why do you even need a marketing budget? you have a monopoly and people are surely familiar with the concept of trains? 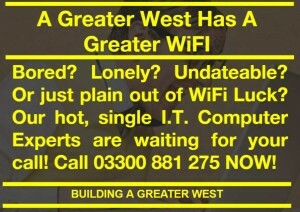 A Greater West has a Greater WiFi! I've said it before and I'll say it again : Brunel must be spinning in his grave at what's become of his railway. 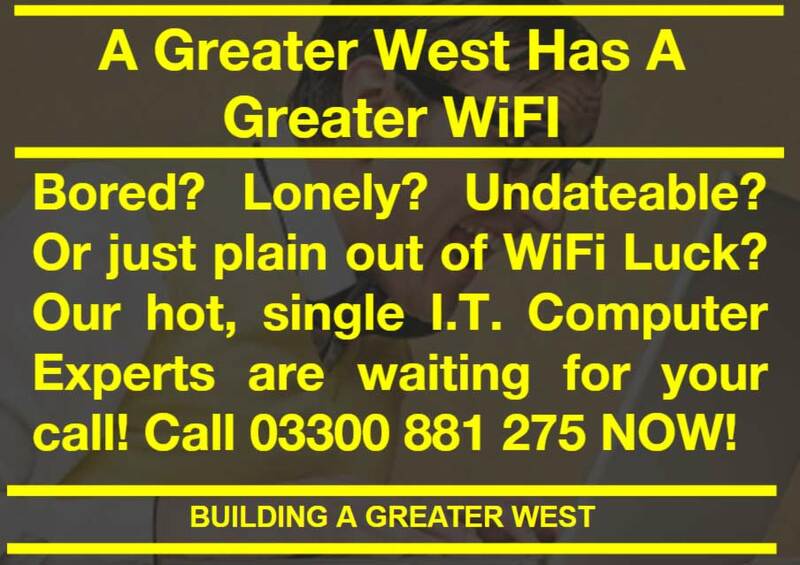 #greaterwest indeed . @FGW @tedchong469 @ThatsMyTrain Signals, trains, ticketing systems all buggered……building a Greater West? 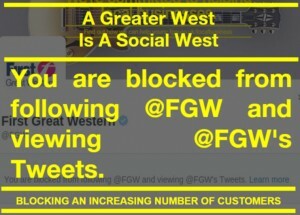 A #GreaterWest Is A Social West! @FGW 2nd time this week Jess. What exactly are #FGW doing on this route to live up to the #BuildingAGreaterWest campaign? 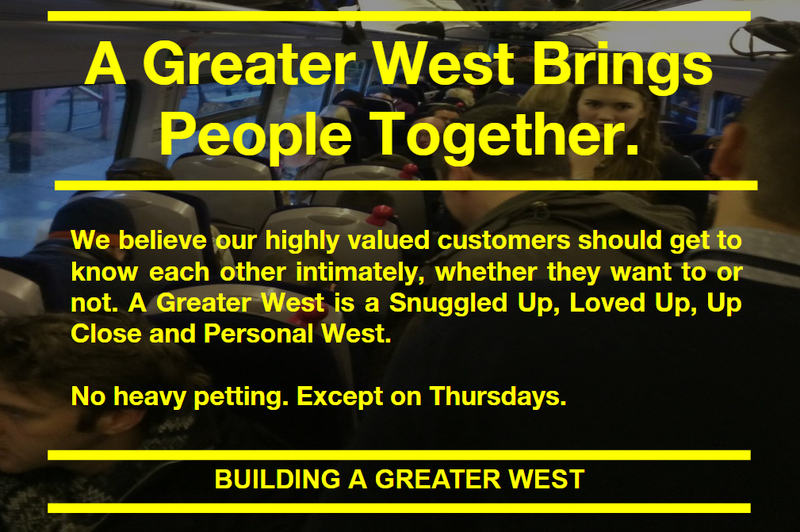 @FGW but instead it appears you are just building a broken west rather than a greater west. @FGW so, if you're investing so much, why are services still so poor? @FGW thanks for that. Your leaflets on board make it sound like your paying for it. @GWRUK a.m. train – standing room only by Newport, got to Bristol late; p.m. train – stood from Bristol to Newport. Better? Faster?